Official synopsis: "IT'S THE NIGHT BEFORE HOGSWATCH. AND IT'S TOO QUIET. Where is the big jolly fat man? Why is Death creeping down chimneys and trying to say Ho Ho Ho? The darkest night of the year is getting a lot darker... Susan the gothic governess has got to sort it out by morning, otherwise there won't be a morning. Ever again... The 20th Discworld novel is a festive feast of darkness and Death (but with jolly robins and tinsel too). As they say: 'You'd better watch out...'"
Ah, nothing quite says Merry Christmas like Death parading around in a red suit and beard like the jolly fat man himself, the Hogfather, now does it? 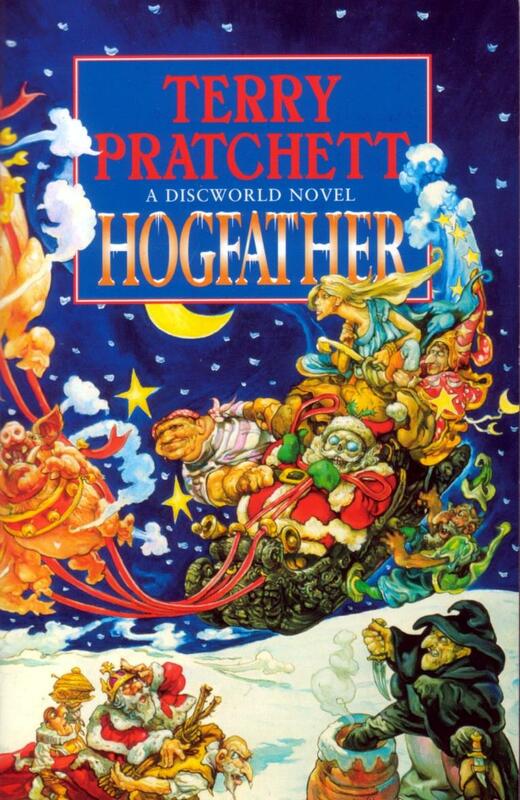 In this festive addition to Pratchett's fantastical Discworld series, someone wants the Hogfather dead, this bringing the Disc itself into a never ending darkness... But there's always a hero in a tale like this, and in Hogfather, the role, the duty even, of the hero falls upon Death. It's a little different to his day job, granted, and this makes for a hilarious read. 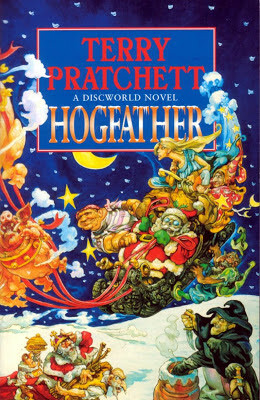 There's something about Hogfather that just makes me feel all warm and fuzzy inside when I read it. I first read it when the tv adaptation was on Sky back in 2006, so I'd of been 14 and I fell in love. It was the first of Terry's books I read and it's the one I have read the most. In fact it's an annual read and I always have to read it at this time of year. In fact as I write this review I am in the midst of another re-read, but I had thought I'd reviewed it last year, alas I did not so here I am! And as usual the writing is clear, fluid and filled with wit. I do find that every time you re-read one of Terry's books, you pick something else up, get another layer of the story that you'd missed previously. They're so clever, and so well thought out. Deaths comments in particular, his thoughts on humanity and their quirks, are so hilarious that at times when reading it I was in stitches. So insightful. Honestly, even if you aren't a fan of Terry, or perhaps like me before I read this book you've never read any of his work, this is a great place to start. It's funny, wintery and perfect for this time of year. I really cannot recommend it enough. Just get it and see what I'm on about, I'm rambling here, so it's better for you to make up your own mind and then you'll see exactly why I love this book so much! Maybe because it's the first of the Discworld books I've read, although I haven't read that many...) but it's my favourite and one I will continue to read again and again, year in, year out! This looks really fun! Thanks for letting me know about it - will def be checking it out.